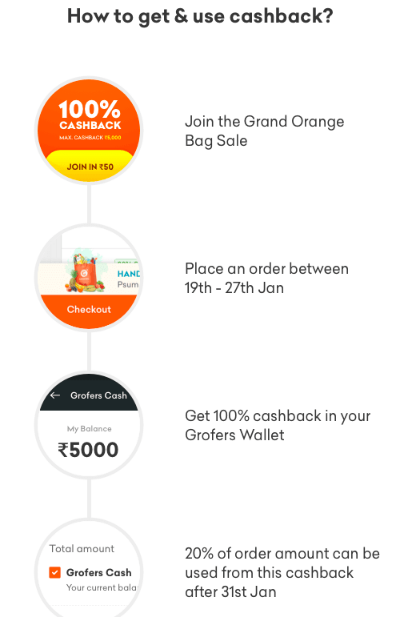 User needs to register for the Grofers Grand Orange Bag Days – by the 19th of Jan.
for 30000 thousand worth purchases only 5000 discount is given. discount works out to 16.67% only better go for profit club in big bazaar. Main Part of the offer you can use 20% of cashback after 31 Jan 2019 not full amount in single order. How is it 100% cb?? Last date to join – 12th Jan.
You can use 20% of the cashback amount after 31st Jan. Combine with this ongoing bank offers & wallet offers so it is a good deal. Cash back can’t be redeemed on oil, ghee and baby food products. Just to be clear.. the cashback can be used multiple times (20% of order value at a time), right? Is there an expiry to it.. 90 days / 6 months.. anything? If I understand this correctly.. I can shop for 1000,, and on my next 5 order worth 1000, it’ll save 200 each time.. correct ? There is no requirement of min order value to avail the cashback. Is the sign-up fee refundable? No, the sign-up fee is not refundable. Till when can a user sign up? Last day to sign-up is 12th Jan’19. Hurry up! Don’t miss. Can the cashback be availed on one or multiple orders? Max cashback that a user can avail is 5000. 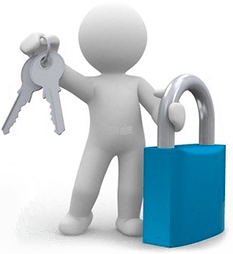 It can be availed in one or multiple orders. Will I get cash back on the purchase of oil, ghee, baby food & SBC subscription? Cashback is applicable on the entire cart and is applicable on purchase of oil, ghee, baby food products & SBC subscription. What if the customer has returned any item post delivery of the order, how will the cashback be adjusted? Yes, the final cashback will be adjusted basis the final delivery of the order. The offer is valid in which cities? The offer is valid for users (new and existing) in Grofers delivery areas of these cities – Delhi NCR, Jaipur, Kanpur, Lucknow, Ahmedabad, Mumbai, Pune, Hyderabad, Bengaluru, Chennai and Kolkata. Can Grofers cash be used to purchase the cashback offer? No, You can not use Grofers Cash to make payment for sign-up. Is 20% cashback offer applicable on use of Grofers cash? 20% Cashback offer is applicable on the existing transactional cash, ie refund in the wallet. The offer is not applicable on promotional cashback from previous transactions. yes supercash is useless usable only 10% mobikwik is dead because of supercash, but this grofers deal is good as grofers cash will cut tge bill by 20% and then u add coupons for additional 15% or so discounts. have taken it.